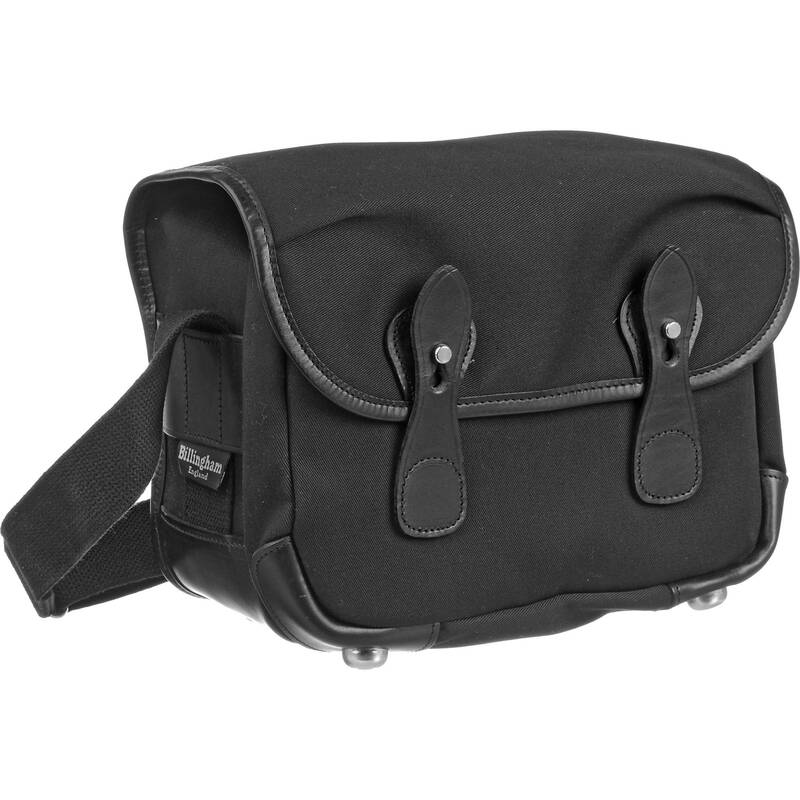 Comfortably carry, store, and protect your small DSLR/mirrorless camera, 1-2 lenses and related accessories with the made in England, black canvas with black leather trim Billingham L2 Camera Bag. An iPad mini/tablet fits in an inner slip-in pocket in the main compartment. Under the front flap, which closes with an easy-to-use clog-bolt strap is a deep dump pocket for additional gear. Photographers will appreciate the touch-fastening padded dividers, green interior lining, leather accents, closed-cell foam padding, and solid brass hardware. Carry your L2 Camera Bag with the adjustable shoulder strap. Brass feet help protect the bottom of the bag from scuffs and moisture. Box Dimensions (LxWxH) 11.653 x 9.764 x 5.591"
L2 Camera Bag (Black Canvas & Black Leather Trim) is rated 4.8 out of 5 by 17. Rated 5 out of 5 by Anonymous from Great bag from Billingham I was torn between L2, S2, Digital/Small Hadley and canvas Ona bags. After trying out all of them at B&H and other places, I've come to conclusion that L2 is the best fit for my equipments (Sony A7Rii with combination of Sony 35mm, leica 50mm and V 21mm). I've so far brought it to both overseas and domestic trips, and the bag withstood and exceeded all my expectations. It's durable, practical, perfect size, LIGHT and stylish. I guess the only thing that I might complain is that it doesn't have any outer (back or side) pockets, but honestly I can leave with that - L2 bag has plenty of pockets and storages spaces. Good luck and happy searching! Rated 5 out of 5 by Mike in South Park from Great fit for M bodies I've had this bag for over a year. Perfect for my M6 with lens attached, two spare lenses, plenty of film and filters. Could have used one more partition to separate lenses, but I already had those in pouches. Basically same Billingham bag that Leica markets. The Leica bag comes with a large Leica badge embroidered on the flap not shown in the B&H website photo. It pretty much says, Steal me first. So, I exchanged it for this bag. Absolutely no functional issues with this bag. The quality is excellent, and it rides well on the shoulder. I'm thinking about getting another Billingham bag for hauling around the DSLRs. Rated 4 out of 5 by Anonymous from Great Mid-Size Bag Typical high quality construction and materials. I'm using this for a single body 6x7 medium format kit with extras. The upside down strap closures seem backwards until you try to open or close them while wearing the bag - then the design makes sense. My only disappointment was that the small from section of the bag doesn't have any padding or inserts on the bottom, leaving the bottom feet rivets sticking up in the bag where they could scratch your equipment or iPad. I contacted Billingham about getting a padded strip, but haven't heard back from them yet. At this price, the shoulder strap pad should be included, in my opinion. Rated 5 out of 5 by Rich in San Francisco from At first I didn't Like this at all, BUT. Having returned to Leica M digital equipment after 15 years with high-end Nikon DSLR, I bought this bag as well, because it is smaller than my Lowe Pro bag. Initially, I didn't like it. But now after a few weeks of use, I'm very happy with it. Room for my ME w/35 Summicron, 24mm Elmar Aspherical, and 90mm Summarit, plus a full-size Metz flash. Including the extra battery for the ME, Viewfinder for the 24, and diffuser for the flash. The fit and finish of this product is first class, including the optional wide shoulder pad. I trust it to protect my investments, and it's easy to get the camera out quickly! Rated 5 out of 5 by Gregg from A beautiful and capable bag Like many others, have had a love hate relationship with bags. Of course, have gone thru a variety of camera systems and each bag was perfect for a given system. However, I wish I had purchased a Billingham 30 years ago. Not because it would have functioned any better than another bag, but it would have 30 years of patina. These are wonderful looking and feeling bags - the leather feels good, the canvas is soft. It's one of those items that will get better with age. Oh yeah, it does what a camera bag should - protection, etc. My setup follows: two vertical dividers which allows Nikkor 24/2.8 and 50/1.8 stacked on the left, Nikon Df in the center, and a Nikkor 85/1.8G on the right. An SB-300, a few filters, cards, etc go in the front pouch. Rated 5 out of 5 by Lorie from Excellent quality and very practical I ordered this bag along with the Billingham Hadley Digital, Stowaway Pola and Domke F-8 small and this is the bag that I kept. I was looking for a bag that would hold my Sony a7 with a 35mm lens (and another lens down the road), cards, filters etc., but also hold my wallet, EpiPen, travel documents - perhaps a novel or kobo or maps etc if I am travelling. This bag is a little boxy, but it is extremely simple, practical and versatile with respect to internal areas and positioning of the padded dividers. I wasn't sure about the little metal feet, but it offers nice protection when putting the bag down or storing under the plane seat etc. Instead of carrying a purse and a camera bag, I can have everything in one location which makes good sense for me. It is easy to open and remove items and at the same time they feel securely in the bag when it is done up. Rated 5 out of 5 by Anonymous from Almost ten years of heavy use. Carries one rangfinder (M type) or small SLR and three or four small lenses, plus assorted odds and ends. Perfect for traveling light. It's rugged but classy; doesn't look out of place in the lobby of a swank hotel. At the same time doesn't yell expensive gear inside!!! to thieves. Easy access to gear while being safe at the same time. Highly recommended. One of three different Billinghams I own. I own a Fujifilm x-e2 with a 18-55 lens, later certainly one or two other lens and a flashlight, and I want to buy a Billingham bag. I hesitate between the Hadley small, L2, f2.8 and Hadley pro. Who can help me finding the best model (not too big, not too wide, with possibly additional pockets)? will the leica x2 with the ev2 attached fit this bag? yes this bag will fit that outfit.